Ballroom Dancing – Definition: A set of partner dances, which are enjoyed both socially and competitively around the world. As a result of its performance and entertainment aspects, ballroom dance is also widely enjoyed on stage, film, and television. Ballroom dance may refer, at its widest definition, to almost any type of partner dancing as recreation. With the emergence of dancesport, however, in modern times the term has become narrower in scope, and traditionally refers to the five International Standard and five International Latin style dances. The two styles, while differing in technique, rhythm and costumes, exemplify core elements of ballroom dancing such as control and cohesiveness. There are also a number of historical dances, and local or national dances, which may be danced in ballrooms or salons. 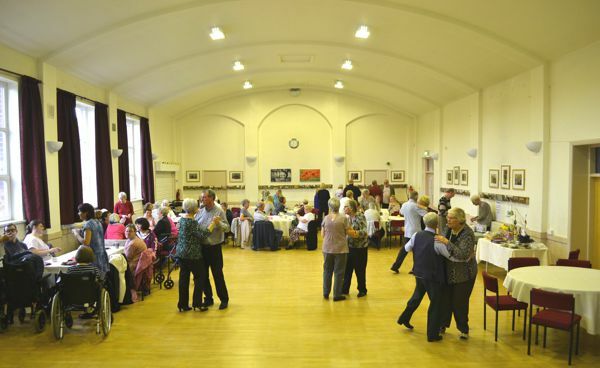 Sequence dancing, in pairs or other formations, is still a popular style of ballroom dance and one that is most enjoyed by the Mapplewell and Staincross Village Hall Ballroom Dancers. Blues Dancing: There are ongoing debates within blues dancing and swing dancing culture today about what constitutes “authentic” or “part of the tradition of” blues dancing. Some hold the position that a blues dance that does not possess the stylistic, aesthetic and rhythmic qualities of Africanist dance cannot qualify as blues dance. Others argue that a blues dance which has had very little creative contribution from black dancers or draw from the base of movement they created, does not qualify either. Yet a third position might hold that a blues dance is simply dancing to blues music, regardless of the steps performed or whether they involved partnered or solo steps, or whether the steps and movement are aesthetically tied. There are dancers, moving to music which is not blues, performing steps which have no Africanist features or historical tradition who call what they do “blues dancing”. There are many variations and positions on these debates about what is and is not blues dancing within the tradition of the original dances among the contemporary dancers. Bossa Nova: This has at its core a rhythm based on samba. Samba combines the rhythmic patterns and feel originating in former African slave communities. Samba’s emphasis on the second beat carries through to bossa nova (to the degree that it is often notated in 2/4 time). However, unlike samba, bossa nova doesn’t have dance steps to accompany it. Overall, the rhythm has a “swaying” feel rather than the “swinging” feel of jazz but was also influenced by the blues, but because the most famous Bossa Novas lack the 12-bar structure characteristic of classic blues, as well as the statement, repetition and rhyming resolution of lyrics typical of the genre, bossa nova’s affinity with the blues often passes unnoticed. Cha-Cha: This was originally called the “cha-cha-cha.” The term came from Haiti and resembled the sound the bells made when rubbed. Cha-cha is a very flirtatious dance with many hip rotations and partners synchronizing their movements. The dance includes bending and straightening of the knee giving it a touch of Cuban motion. Foxtrot: The foxtrot is a true American dance, credited by a vaudeville performer Harry Fox in 1914. Fox was rapidly trotting step to ragtime music ( an original form of jazz). The dance was originally named as the “Fox’s trot”.The foxtrot can be danced at slow, medium, or fast tempos depending on the speed of the jazz or big band music. The partners are facing one another and frame rotates from one side to another, changing direction after a measure. The dance is flat, with no rise and fall like the waltz. The walking steps are taken as slow for the two beats per steps and quick for one beat per step. Foxtrot is performed for both International Standard and American Smooth. Jive: The jive is part of the swing dance group and is a very lively variation of the jitterbug. Jive originated from African American clubs in the early 1940s. During World War II, American soldiers introduced the jive in England where it was adapted to today’s competitive jive.In jive, the male leads the dance while the women encourage the men to ask them to dance. It is danced to big band music and some technique is taken from salsa, swing and tango. Jive is performed as an International Latin dance. Mambo Magic: The Mambo originated from Cuba but the name came from Haiti. Mambo music was first written in late 1930s by a Cuban composer. Eventually in the late 1940s, a musician named Perez Prado invented the dance mambo. Perez introduced the dance from Havana to Mexico, and making its way up to New York. Mambo is performed as an American Rhythm dance. Paso Doble: The paso doble originated from Spain and its dramatic bullfights. The dance is mostly performed only in competitions and rarely socially due to many choreographic rules. The man plays the role of the matador while the women take the role of the matador’s cape, the bull, or even the matador too. The chassez cape refers to the man using the woman to turn her as if she is the cape and the apel is when man stomps his foot to get the bull’s attention. Paso double is performed as an International Latin dance. Quickstep: The quickstep was invented in the 1920s as a combination of faster tempo of foxtrot and the Charleston. It is a fast moving dance so men are allowed to close their feet and the couples move in short syncopated steps. Quick step includes the walks, runs, chasses and turns, of the original foxtrot dance, with some other fast figures such as locks, hops, and skips can be added. Quick step is performed as an International Standard dance. Rumba: The Rumba is known to be the most romantic and passionate of all dances. In the early 1920s, the dance came to the United States from Cuba and became a popular cabaret dance during prohibition. Rumba is very polyrhythmic and complex. It includes Cuban motions through knee-strengthening, figure- eight hip rotation and swiveling foot action. An important characteristic of rumba is the powerful and direct lead achieved through the ball of the foot. Rumba is performed for both International Latin and American Rhythm. Tango: The Tango is a partner dance that originated in the 1880s along the River Plate, the natural border between Argentina and Uruguay, and soon spread to the rest of the world. Early tango was known as tango criollo (Creole tango). Today, there are many forms of tango extant. Popularly and among tango dancing circles, the authentic tango is considered to be the one closest to the form originally danced in Argentina and Uruguay. Waltz: The Waltz began as a country folk dance in Austria and Bavaria in the 1600s. In the early 1800s it was introduced in England. It was the first dance where a man held a woman close to his body. When performing the dance the upper body is kept to the left throughout all figures, woman’s body leaves the right side of the man while the head is extended to follow the elbow. Figures with rotation have little rise. Sway is also used on the second step to make the step longer and also to slow down the momentum by bringing feet together.